← Collecting Marine Invertebrates for a Home Aquarium? What’s the Scoop on Sea Urchins? Answer: Yes, sea urchins are legal to take in California with a sport fishing license. 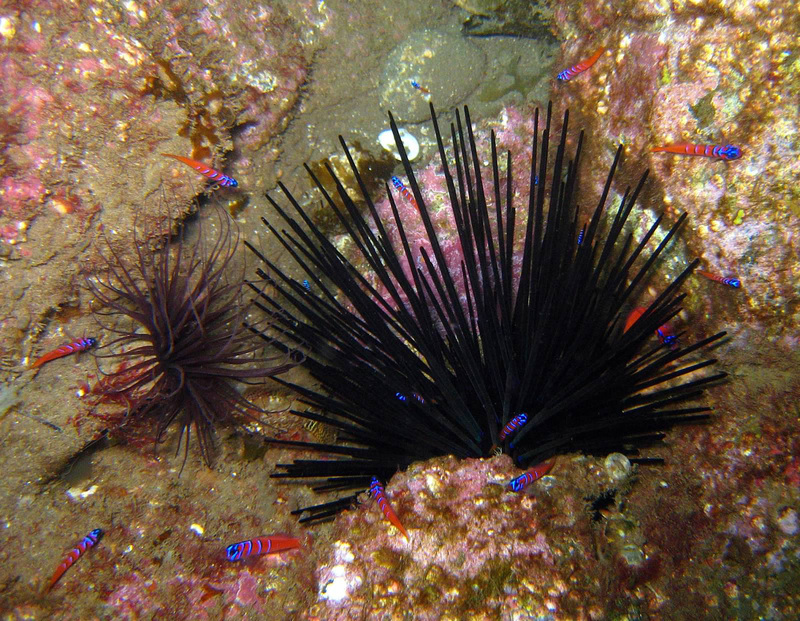 The season is open year-round for all species of urchin and the limit is 35 urchins (California Code of Regulations Title 14, section 29.05). These regulations can be found in the Sport Fishing Regulation Booklet, along with listings of the state beaches and Marine Protected Areas in Southern California that are closed to the take of sea urchins. If you still have questions after reviewing the regulation book, please call your local California Department of Fish and Wildlife (CDFW) office. Why do second deer tags cost more than the first? Answer: The reason is because the second tag is a privilege after the purchase of the first tag and so is sold at a higher fee. Starry flounder fishing in San Francisco Bay? Answer: Yes, when the season is open, and it’s open now. Since starry flounder is considered a federally managed groundfish species (per CFR 50, section 660.11) it can only be taken in the San Francisco Groundfish Management Area (San Francisco Bay) from a boat between June 1 through Dec. 31. The season is closed to boat-based anglers the rest of the year. For divers and shore-based anglers, starry flounder can be taken year round in San Francisco Bay. There is no limit for starry flounder in the ocean and San Francisco Bay (CCR Title 14, section 27.60(b)). The limit on starry flounder for boat-based anglers would either be zero, or no limit, depending on the time of year. For a quick online reference guide for San Francisco Bay that specifically mentions boat-based angling, please see www.dfg.ca.gov/marine/mapregs6.asp. (1) A notice shall be posted where it is visible to all persons who bring skins to a taxidermist for preparation, stuffing, or mounting, stating that the skins will be sold pursuant to chapter 6 (commencing with section 3046) of part 4 of division 3 of the Civil Code if unclaimed or unredeemed by the owner. (2) The department shall, upon request, be provided with the name and address of any person who has failed to claim or redeem any skin or part thereof. (3) The sale price of any prepared, stuffed, or mounted skin or part thereof, shall not exceed the actual cost of labor, preparation and advertising costs relating to the sale, less any amount already paid by the owner of the skin for its preparation, stuffing, or mounting. (4) No skin or part of any fully protected, rare, or endangered species of fish, reptile, bird or mammal may be sold. (5) No skin or part of any migratory bird covered by the federal Migratory Bird Treaty Act or Bald Eagle Act may be sold without approval of the U.S. Fish and Wildlife Service. (6) The notice to customers required in (1) above shall include a copy of subdivision (d) of this regulation. The complete Fish and Game Code and complete Title 14 are available online at www.dfg.ca.gov/enforcement/. This entry was posted in Deer Hunting, Invertebrates, Methods Of Take, Saltwater Fishing, Taxidermy, Uncategorized and tagged bears, invertebrates, saltwater fishing, sea urchins, taxidermy. Bookmark the permalink.